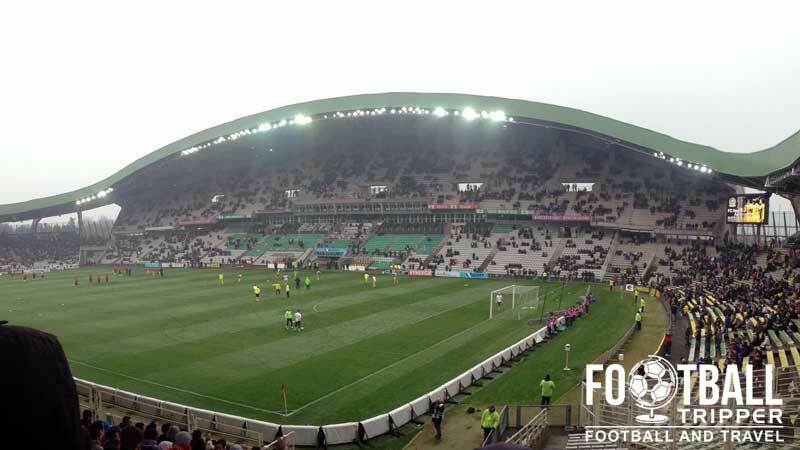 Stade de la Beaujoire – Louis Fonteneau is the home ground of FC Nantes, a French team currently in Ligue 1. The 38,000 capacity stadium has hosted the French national team on 4 occasions, as well matches in the 2007 Rugby World cup. 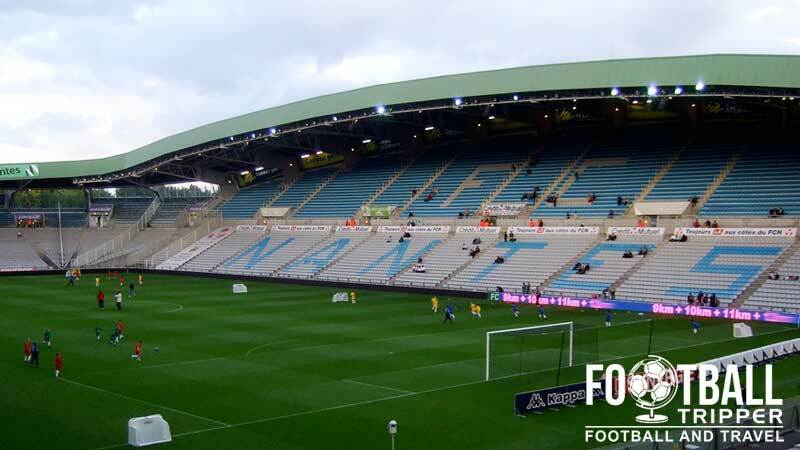 Stade de la Beaujoire was built primarily for the 1984 Euros, and it replaced FC Nantes former stadium, Stade Marcel-Saupin which had become a set of outdated facilities for Ligue 1. The opening friendly and curtain raising fixture was held between the home side and Romania which marked the international dimension to the stadium, with an original capacity of over 50,000 spectators. Stade Beaujoire hosted two group matches in Euro 1984: France V Belgium (5-0) and Portugal v Romania (1-0) and it was at this tournament where the record attendance of 51,359 was set, with the home nation France going on to lift the trophy. 5 Years later, following the death of long serving president, Louis Fonteneau, his name was appended to the end of the stadium name (Stade de la Beaujoire – Louis Fonteneau) as a way of recognising his contribution to the club between 1969-1986. Still refereed to by its original name by most fans, the stadium was once again renovated in 1998, this time for the World Cup. This redevelopment marked the conversion to all-seater with the capacity reduced to 38,285, with additional VIP boxes responsible for taking up some of this space. The World Cup of 1998 which also saw the home nation of France triumph like Euro 1984, saw FC Nantes stadium host five group matches, and perhaps most notably a quarter final between Brazil and Denmark with eventual runners up Brazil winning 3-2 with a brace from Rivaldo. De La Beaujoire is comprised of four stands: Nord, Est, Sud and Ouest. Away fans are housed within a fenced-off area within corner between the northern goal-end and the eastern tribune. Reminiscent of Dublin’s Aviva Stadium, views from this small stand are generally great however the roof coverage leaves a lot to be desired. Voted as “the most liveable city in Europe” in 2004, you’ll easily find places to eat and drink throughout the city of Nantes with some of the most fan friendly pubs listed in the map below. Within Nantes Stadium there is a “proper” place to eat, known as Restaurant du Stade. The club’s official restaurant has a variety of lunch options and you can see the full menu online, although it’s unclear whether or not you need to make reservations in order to eat. Within the local area there are a few sports based bars such as Eurest Sports et Loisirs, Les Etoiles du Stade and the popular Italien Del Arte Nantes – Pardis restaurant. FC Nantes operate one official store at the Beaujoire Stadium which is probably the best place to get all your Canary merchandise, with the obvious exception of FC Nantes Boutique. The shop is closed on Tuesdays and Thursdays unless there is a match, and the official address is: 5 Boulevard Beaujoire NANTES 44300. 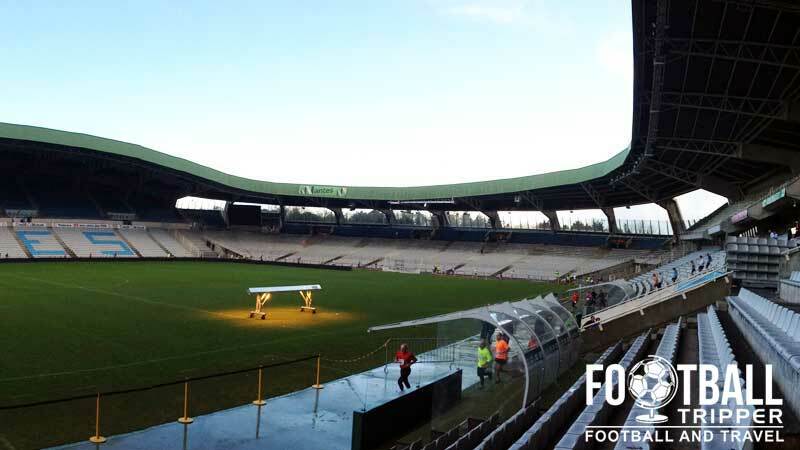 As a stadium built in the 1980s, it should be no surprise to know that the operators of Stade de la Beaujoire don’t offer fans the chance to go on stadium tours. 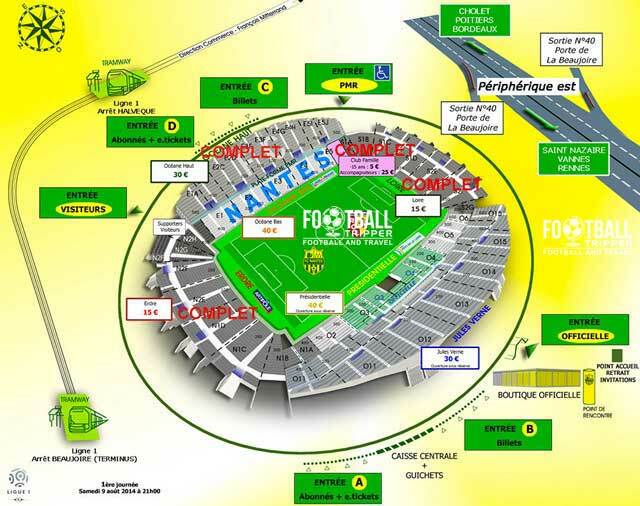 Tickets to see Nantes play at home can be purchased online, around the city at various ticket points (France Billet and Ticketnet) and of course at the stadium itself in the weeks leading up to the match. Whilst you can purchase tickets a few hours before kick-off, you can save a few euros if you purchase them in advance – availability dependant of course. Price wise, expect to pay anywhere between €19.00 – €46.00 for a decent seat, with tickets for the more popular Tribune Loire stand actually being cheaper than other options as it is behind the goal. 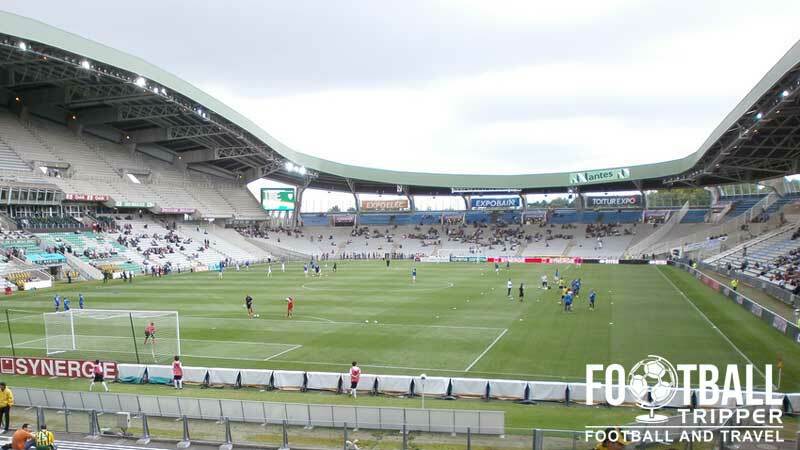 Stade de la Beaujoire is situated in the North East of Nantes City centre, approximately 5km away from the city centre, or Centre-Ville and main railway station. A look at the outer shell of Stade de La Beaujoire’s taco-like exterior. As you can see there is quite a bit of on-site parking available which is good to know. Beaujoire is placed just inside the circumference of Nantes’ Périphérique ring road which makes it very accessible via car. From the North-Eastern section take exit 40 signposted as Porte de la Beaujoire and then follow signs to the stadium which you should be able to see once on the ring road. Parking is available next to the stadium, but get there early to ensure your space. Nantes Railway Station (Gare de Nantes) is very central and connects the Western French city to the rest of the country via the TGV high speed railway line, with trains to Paris taking just over 2 hours. The Nantes tramway which opened in 1985 is one of the most widely used public transport networks in France, and the stadium can be reached using tram line number 1 north. Nantes Atlantique Airport is located 8km South West of the city and it is the largest airport in Western France connecting the local region to a host of national and international cities. In addition to this, there are suggestions that a larger Aéroport du Grand Ouest could be built 30 km North-West of Nantes in the area of Notre-Dame-des-Landes but the multimillion pound project keeps being delayed due to the controversy based on the location in which it is being built. The closest hotels to the stade all feature Beaujoire in their name which is helpful with examples including Hotel Ibis Nantes La Beaujoire and Logis Beaujoire Hotel. If you don’t want to be stuck near the stadium after the match and actually want to visit the rest of the city then you’re better of looking for hotels nearer the Centre-Ville with Hotel La Perouse, Hotel Saint-Patrick and Hotel Chateaubriand being three choices to get you thinking.